Everyone loves our personalized photo blankets! Choose from our 4 different styles of blankets and many design options to create the perfect gift or décor item for your home. At Print Shop, you can not only order photo prints, you can create an array of exciting gifts and decor accessories that bring your memories to life! Our custom collage blankets are no exception! Select photos from your phone, computer, or even Facebook, and use them to design your own blanket layout. We have dozens and dozens of custom options to choose from so you can make the perfect decor accessory that’s not only stylish, but practical too! 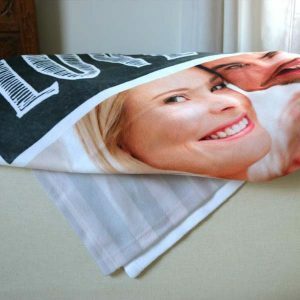 Make your own photo blanket in a matter minutes! At Print Shop, all you have to do to get started is collect and upload your photos! Find photos on your phone or laptop and use them to create your layout! You can print a single photo edge to edge or pick from one of our many templates to showcase multiple pictures from your collection. When you’ve finished arranging your photos, you can use our text feature to include your name or a favorite quote on your blanket design. With a few simple steps, you’ll have your creation completed and ready to order! If you’re looking for personalized photo gifts, you’ve come to the right place! Print Shop is the best site online for creating your own unusual gifts for family and friends. 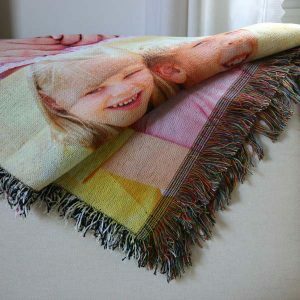 In addition, our custom photo blankets are an ideal gift for anyone on your list, for any occasion. Make Mom a custom fleece blanket for Mother’s Day. 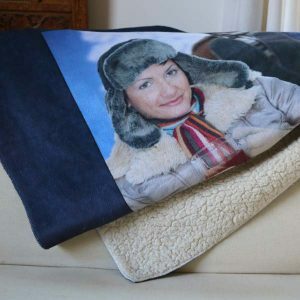 Or, design a sherpa fleece photo blanket for your best friend on her birthday. Furthermore, you can pick out a template that accents both their photos and style. For the ultimate gift, you can create a stunning blanket that your loved ones won’t soon forget! In addition to professional photo printing, Print Shop offers personalized decor that you can create yourself to compliment your home! Our photo personalized blankets are the perfect decor accessory since they keep you cozy and warm while brightening up your living area. Our photo tapestry blanket is perfect for hanging on your wall. 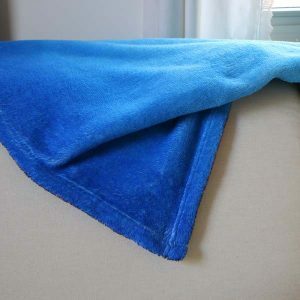 On the other hand plush fleece photo blanket can be draped over your favorite chair or family room sofa for an extra splash of color. In addition to our custom canvas prints, our photo blankets are another great way of showcasing your favorite memories to liven up your home!